download latest release of DCEVM Java patch and launch the installer (e.g. java -jar installer-light.jar). Currently you need to select correct installer for Java major version (7/8). select java installation directory on your disc and press "Install DCEVM as altjvm" button. Java 1.7+ versions are supported. Note: You should open command prompt as administrator when running java -jar installer-light.jar command. 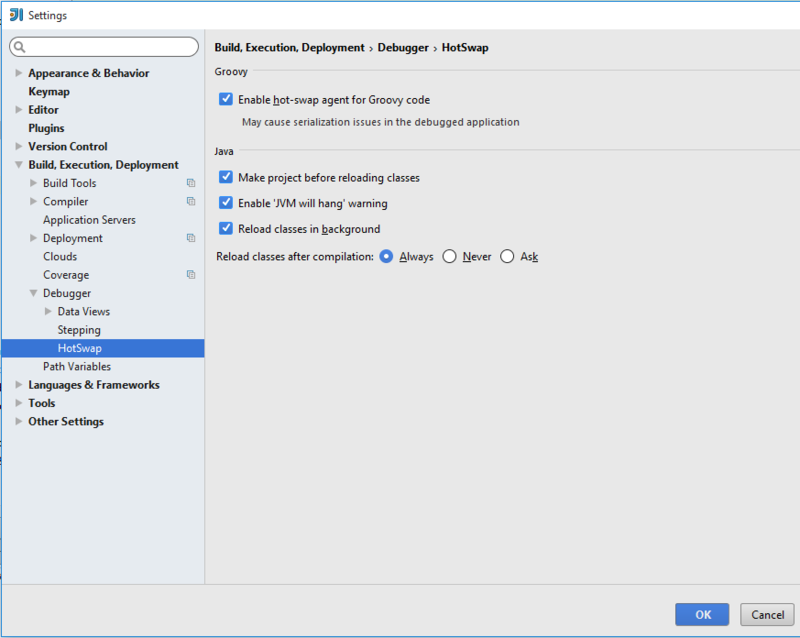 See Intellij IDEA and Netbeans configuration. 3. This agent only works in debug mode. Therefore we should start the application with debug mode. Check that the agent and plugins are initialized correctly. HOTSWAP AGENT: 9:49:29.548 INFO (org.hotswap.agent.HotswapAgent) - Loading Hotswap agent - unlimited runtime class redefinition. 4. Save a changed resource and/or use the HotSwap feaute of your IDEA. Currently Tomcat 7.0.64 and below versions are supported.